State-level retirement reform efforts continue to emerge at a breathtaking pace, with 22 states introducing legislation since Trump’s inauguration. State policymakers are modeling legislation on bills moving forward in other states, following four policy vehicles. The comprehensive hybrid model that combines marketplaces, open MEPs, and auto-IRAs provides the best option to increase access to coverage. State-level programs point toward comprehensive reform in Guaranteed Retirement Accounts. Despite evidence of a systemic, nationwide retirement crisis, federal reform efforts have gone from making slow progress under the Obama administration to taking large steps back under the Trump administration. The Obama administration enacted myRA, a small-scale retirement savings program, and issued federal rules to pave the road for state reform and establish protections for retirement investors. President Trump abruptly canceled the myRA program, eliminated federal support for state reform, and delayed the fiduciary rule. In the absence of comprehensive federal action, state-level retirement reform efforts continue to emerge at a breathtaking pace. In only six years, from 2011 to 2017, 40 states have proposed – and 9 have enacted – bipartisan retirement reform to provide private-sector workers access to retirement savings accounts. Since President Trump’s inauguration, 22 states have proposed – and Vermont enacted – retirement reform bills. State-level retirement reform proposals serve as a bellwether for federal retirement reform. As such, they are invaluable experiments for evaluating how best to ensure all working Americans are enrolled in pre-funded retirement plans. 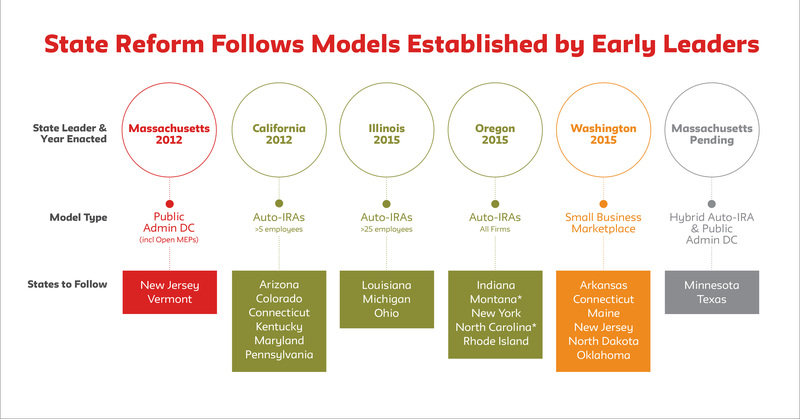 Of the nine states that have enacted reform, only two programs are up and running (Oregon and Massachusetts), with the rest in various stages of implementation. In the absence of tangible outcomes, state policymakers are modeling legislation on bills moving forward in other states. Thus, the first states to enact reform have had tremendous influence over the shape of reform in subsequent states. For example, laws passed in Connecticut and Maryland were based on California’s 2012 plan, while proposals in Louisiana, Michigan and Ohio were based on Illinois’ 2015 law. The comprehensive hybrid model that combines marketplaces, open MEPs, and auto-IRAs provides the best option to increase access to coverage and offers the most potential to support all four principles of reform. This framework is exemplified in the New York City proposal put forward by City Comptroller Scott Stringer. The strength of the full hybrid model is that it allows employers the choice of how to offer their employees a retirement savings plan, but does require they offer, at a minimum, auto-IRAs. For example, an employer can choose to provide a qualified, vetted plan in the marketplace or offer an ERISA-based plan through an open MEP where the state serves as plan sponsor and fiduciary. Both of these options support employers’ ability to make contributions to their employees’ savings plans. However, If employers choose not to participate in one of these two options, the hybrid model requires they offer coverage through auto-IRAs. While auto-IRA plans do not allow for employers contributions due to ERISA limitations, they use auto-enrollment and (in some plans) auto-escalation to support workers’ need to accumulate retirement savings. State action is evidence of a bipartisan, grassroots demand for a long-term, comprehensive federal option that can ensure all workers’ retirement security. The optimal policy solution is Guaranteed Retirement Accounts (GRAs): mandatory, professionally managed accounts that supplement Social Security. These accounts should be managed by the federal government so they will available to all American workers, and so it is not necessary for companies to navigate different policies in different states. Workers and their employers would split annual contributions of at least 3 percent of employee salaries to adequately close the gap between income from Social Security and the expert recommended income necessary for a secure and comfortable retirement. To be effective, these accounts must be mandatory and early withdrawals prohibited. Reform should guarantee all workers the return of their principal plus an appropriate rate-of-return.